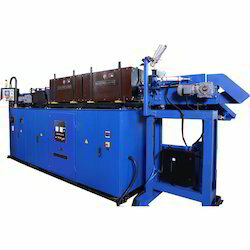 Our product range includes a wide range of forging and forming machine, in-line induction heating system for hot rolling and induction hardening service. Being one of the leading organizations, we are engaged in providing Forging and Forming Machine. Rendered by power up to 50 kW to 1000 kW, the offered machine has high degree of automation. To meet the demands of customers, we are providing these machines in different specifications. 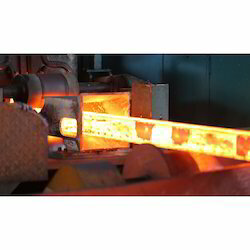 Electrothermal's In-Line Induction Heating System for Hot Rolling/ reheating of bars, billets, slabs, plates, and blooms. Our heater provides temperature control and uniform heating from the surface to core and head to tail of the product. Our heater is highly efficient and compact; available in frequencies between 50 Hz to 6000 Hz. and power between 500 kW to 10000 kW. Hot rolling is used to form thinner pieces of metal by using heat. This process is mainly used to change the shape and thickness of a metal. The starting material is usually large pieces of metal, like semi-finished casting products, such as slabs, blooms and billet. If this product came from a continuous casting operation the products are fed directly into the rolling mills at the proper temperature. Steel slabs or billets are first heated to an extreme temperature, which is slightly above the metal’s recrystallization temperature, and then they are sent through rollers that can be programmed to apply a controlled amount of pressure to form the metal into the desired size or thickness. Hot rolling is used mainly to produce sheet metal or simple cross-sections such as rail tracks. Other typically use of hot rolling is to produce TMT bar, angle, channel, I-beam and wire rod. 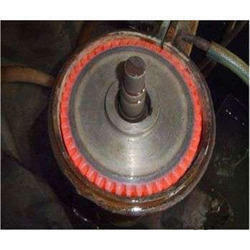 Clients can avail from us Induction Hardening, which is provided at industry leading prices. These services are demanded to harden the specific parts of the material. Also, we render these services as per the demands of customers to gain their maximum approval. These services ensure to increase performance and saves energy with cooling control.